The gentle golden retriever is a popular breed in most homes. These pets are known for their playful personalities, and it makes them a good addition to any dog-loving family. 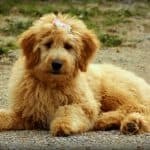 Why should you get the best food for golden retrievers? How many proteins and fat do they need? Picking out a nutritious dog food for your pet can be stressful. Some dogs are picky while others can easily be affected by allergies. So you need to be careful when choosing a formula. We have come up with some tips to help you to know what to look out for when searching for a high-quality product. Ensure that you read the label on the pack or can. This should contain the ingredients used in making the product. Always look out for the first five ingredients in the product, it is the most important information. Check the dog food’s source of protein. It should normally come from an animal instead of vegetable. Ensure that the food you opt for doesn’t contain by-products. This ingredient is difficult to digest and won’t make your pet happy. Food with color, artificial flavors and preservatives must be avoided altogether. These compounds can cause cancer, so it is safer to avoid them entirely. Check the label for the source of fat used in the dog food. Some fats are far better than others since they are easy to digest. An example of this is animal fat and vegetable fat. The later isn’t easy to digest. Don’t buy dog food that doesn’t specify the source of the fat and meat. This could mean that the ingredients are derived from low-quality sources. Once in a while, change brands to ensure that your pet enjoys different varieties and flavors. Don’t buy dog food that contains pheasant, rabbit or venison unless you have spoken with a vet. Such ingredients are not necessary for any dog’s diet. You shouldn’t feed your pet raisins, grapes, or onions. You should also ensure that they are not contained in the preferred brand. No matter how convincing they look, they are poisonous to your dog. Don’t buy more than your dog needs at a time. Only buy what your pet needs for a month at most. Lastly, ensure that the food is stored properly in an airtight container. 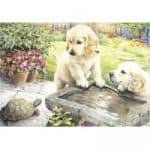 Below is a list of the best food for golden retriever puppy to help you during your search. Merrick dog food is one of the best dog food for senior golden retriever. 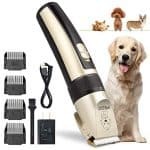 It is a good choice for all breeds, and it is also a favorite for golden retrievers. The main ingredient is deboned chicken while other ingredients are meat meals from turkey and chicken. This formula’s protein content is derived from fish, and this makes it a healthier alternative for dogs that are allergic to chicken and beef. This fish, salmon, is nutritious as it helps promote better eyesight. The dry food for golden retriever puppy also contains omega-3 as well as omega-6 fatty acids. This ingredient is needed to maintain the beautiful blonde coat of golden retrievers. These ingredients are accompanied by vegetables and fruits which provide antioxidants. The antioxidants ward off illnesses such as cancer and eye disease. The product is also quite rich in flaxseed oil. This ingredient is a bonus for pet owners who want to be certain that their dog is getting only high-quality fat. Protein comes from mainly fish, and this is good if your pet has allergies to chicken and beef. This food is a decent diet dog food for golden retriever. It is formulated specifically for the breed, and it promotes a healthy coat and skin for your pet. This formula also helps your dog maintain the ideal weight to prevent health issues in future. It contains omega-3 as well as omega-6 fatty acids as well as L-carnitine. These ingredients help prevent heart diseases from developing later in their lives. It also helps them develop stronger muscles. This dog food is formulated for golden retrievers of over 15 months of age. It is also designed with a kibble shape that encourages your golden retriever to chew. This may help prevent any future jaw related issues that could arise because of inadequate jaw movements. 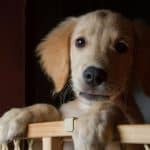 The formula also recognizes the need for a good diet dog food for golden retriever to promote better digestive health. It is made with a formula that maintains a balanced intestinal flora for your dog. It also contains vitamin C and E to strengthen your pet’s immune system and ward off infections. Wellness Core dry dog food comes in different formulas. Some are made for small breeds while others are for large breeds. There are also low-fat formulas with other options to suit the needs of your gold retriever. The ingredient list of this grain-free food contains rich protein sources like turkey, chicken, and salmon. Dog owners can pick one that is suited to their pet. Dogs with sensitive stomachs may also benefit from this product, as it is high in quality protein. It also contains complex, high-quality carbs like omega-3, six fatty acids, and peas. These ingredients are responsible for maintaining the golden retriever’s coat and skin. Many golden retriever puppy food reviews have recommended the Blue Wilderness dog food. It contains lots of protein needed by dogs to maintain a healthy weight. Its protein is derived from real chicken, and this makes it a suitable choice for golden retrievers. Also, this formula doesn’t contain wheat, corn, soy or meat by-products. However, it has LifeSource bits that are designed to provide key vitamins, antioxidants, and minerals to help your pet stay strong and fit. Pet owners have the option of choosing between the variations of Blue Wilderness dog food on the market. It is also a natural alternative for pet owners who want to give their dogs a close-to-natural diet. The formula is free from fillers such as wheat, soy, or chicken by-product. This helps make it a good option for picky dogs. A good golden retriever food diet must be made with high-quality proteins. Wellness Core dog food contains a healthy blend of different protein sources such as chicken and turkey. It also contains salmon oil with a blend of vegetables and fruits. This formula is free of meat by-products or fillers. It is also free of artificial ingredients. The dog food is made especially for adult dogs to help them maintain a healthy weight and coat. It comes in different sizes to make it more affordable. You can get bags of 4 to 26 pounds according to the size of your dog. Its ingredient list contains lots of nutrient sources, and this makes it a healthy option for your golden retriever. This Diamond Naturals dog food for large breed is affordable and tasty. It is a golden retriever favorite as it contains a blend of protein from lamb. The protein content makes it suitable for different breeds of dogs. In addition, the formula comes with lots of important nutrients for the proper development of a dog. It contains chondroitin and glucosamine that are key ingredients in any good dog food. The formula also contains fatty acids from omega 3 and omega 6. These ingredients are essential for optimal health. The dog food is enhanced with superfoods and probiotics without having to resort to corn, wheat or soy. It contains ground rice as well as eggs, cracked pearled barley, chicken fat, and flaxseed. These ingredients help create a well-balanced formula. Fromm dog food is a high-quality formula, and it is suitable for golden retrievers. This food comes in different versions to suit your puppy or adult dog. The brand also has a weight management version to maintain optimal weight. Generally, the large breed version is the leading choice, and it contains high-quality protein from sources such as chicken, lamb, and duck. It also contains cartilage that can help support the dog’s joint in the long term. In addition, this premium formula was made with real Wisconsin cheese. This makes it a perfect source of probiotics and prebiotics. These ingredients help maintain a healthy digestive system. It also contains fatty acids from omega 3 and omega 6. Fortunately, it doesn’t contain meat by-product, wheat, corn or any low-grade ingredient. Like every dog, golden retrievers need high-quality protein in their meals. However, you should note that fat and proteins come from different sources and not all are good for dogs. If you don’t search for dog food with high-quality protein, it won’t have any positive effect on the dog’s body. Usually, high-quality dog food has meat proteins as the key ingredients. The main ingredients in any good dog food shouldn’t be grain or any other carb. Meat meals and whole meats are good protein sources. The whole meats include beef, chicken, lamb and fish and they also contain a lot of water. When the water is removed, they will lose their spot in the top ingredient list. This is mainly because the law requires dog food makers to list all the ingredients by weight just before cooking and processing. When water is added to whole meats, they begin to weigh more. Some dog owners prefer whole meats to meat meals. Meat meals are meat as well, but in this case, the water has already been drained out of it. This ingredient, when used as the key ingredients in dog food, represents premium quality. Lots of good dog food contain meat meals. The less desirable meat products are meat digests and by-products. Fat is also essential for any good dog food. Dogs need to eat food with fat from good sources. However, fat such as protein differs in quality and this depends on the source of the fat. Look out for dog food that has fat sources like chicken fat. Other popular fats such as fish oil are important because they provide omega-3 fatty acid. This acid helps keep your dog’s coat and skin healthy. Lastly, avoid dog food with an artificial preservative like BHT, BHA or ethoxyquin. Also, dog food with sweeteners, artificial colorings, and artificial flavors should be avoided entirely. This is because such ingredients are not needed by your dog, and you should avoid any ingredient that doesn’t provide any sort of nutritional value to your dog. Be sure to read the label to avoid buying food with them. It may be difficult to spot them especially when they are not labeled properly. Golden retriever puppy food amount isn’t much different from feeding your adult golden retriever. You should search for dog food with high-quality ingredients like named fats and meat protein. A good quality dog food contains DHA or docosahexaenoic acid. This compound has been proven to be helpful in brain development in both puppies and children alike. It is crucial for puppy food to contain a decent ratio of phosphorous to calcium. Many nutritionists recommend these nutrients in various ratios for puppies. The calcium to phosphorous ratio should be 1.2 to 1.2:1 respectively. It is vital for growing puppies. To find the phosphorous to calcium ratio on any product, visit the website of the food company as it is rarely placed on the label. Remember that adding certain supplements to the puppy’s diet such as cheese, milk, yogurt and other dairy products can disrupt this ratio. Disruption of this ratio can cause several health problems for the puppy in the future and even now. When a puppy is taking good quality foods, he won’t need any supplements during the first year. Note that adding more meat to the puppy food will also upset the calcium to phosphorus levels as it adds more phosphorus. This article has highlighted the importance of a good diet for your golden retriever. Now let us consider the dietary needs of your golden retriever. Report from the National Research Council of the National Academies shows that a golden retriever should be given food with about 989 to 1,272 calories per day. This figure applies to dogs that aren’t active. Active dogs need 1,353 to 1,740 calories per day. Make sure that you check the number of calories your golden retriever takes daily. Just like any other pet, a golden retriever needs a high-quality supply of protein. The Association of American Feed Control Officials recommends that a puppy is given at least 22 percent protein. For adult golden retrievers, they require 18 percent protein. As for fat, it is an important part of any dog’s diet. This compound should be found in dog food for an adult dog and should be at least 5 percent in quantity. Fat serves as an energy source and also makes the puppy food better tasting and smelling. It will make your pet’s skin healthier and shiner. Your beautiful golden retriever needs a protein-rich meal to maintain a healthy weight and skin. Be sure to pay attention to the ingredients in any dog food to ensure that your pet gets the best dog food for golden retrievers. Our best pick of this review is Merrick Grain Free Dry Dog Food. This dog food’s protein content is gotten from a salmon, and it contains high-quality ingredients as well as fatty acids. It is also a suitable option for picky golden retrievers. When searching for the best dog food for golden retrievers, remember to buy a product that is suited to your dog. It’ll make your pet very happy and healthy.